May | 2016 | Mike Lamberti, From Margate To Cleveland, And Back ! In a season where Livingston struggled to gain that ‘Big Green Machine’ mentality, want to guess where the Lancers will be on Friday? Back in the state sectional finals. 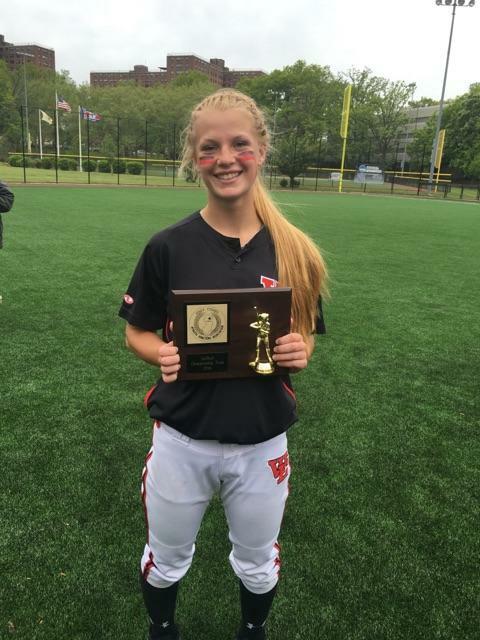 Livingston continued its run in North Jersey, Section 1, Group 4, with an impressive 6-0 victory over third-seeded North Bergen, behind the two-hit pitching of senior righty Sydney McCormack (Syd The Kid). Syd The Kid McCormack has been tremendous in the circle, as Livingston will play for a state championship on June 4. Jason Daily’s team will face old time rival Morris Knolls for the sectional crown on June 4, in Denville. Livingston last played for a sectional title in 2013, when it defeated Knolls for the championship, behind the pitching of Jess Peslak. Livingston (16-11) jumped out quickly, scoring once in the first when Emma Cooney singled and scored on a triple by Blake Saperstein. Leading 2-0, the Lancers added four big runs in the fifth to put the game away. The big hit was a three-run double by Allie ‘Rolls‘ Royce that extended the lead to 5-0. Livingston coach Jason Daily always seems to have his team playing well in crunch time. Royce came around to score Livingston’s sixth run on a double by Julia Viggiano. McCormack, who has been outstanding in the state tournament, pitched her best game, to date, with the complete-game shutout. En route to the final, Livingston has wins over second seeded Kearny and third seeded North Bergen. West Essex will seek its first sectional crown in six years, thanks to a hard-fought, 1-0 win over a tough Indian Hills team, in North Caldwell. The Knights (25-2) got three hits from Bridget (Over Troubled Water) Betley, a marvelous 3-hit shutout from junior Sami Huetter (Canonero II) and the game-winning hit, a single by Amanda Garofalo, which drove in Lilly James with the winning run in the bottom of the eighth inning. 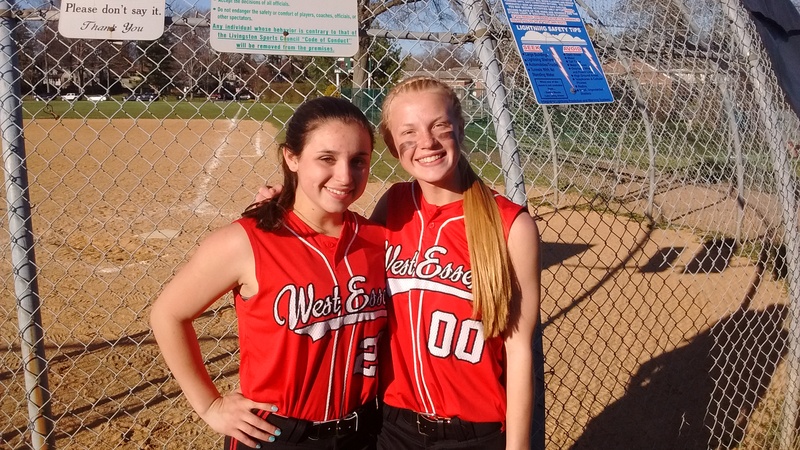 Lilly James (right) scored the game-winning run and Sami Huetter spun an eight inning shutout to lead West Essex to the sectional final for the first time in six years. West Essex will host Sparta in the sectional final. Sparta is the defending sectional champ, in North Jersey, Section 1, Group 3 and advanced to the Group 3 championship game last season. The grind of a busy season, a hot afternoon playing on turf, and the upcoming Memorial Day weekend, didn’t seem to phase Immaculate Heart Academy, as the Eagles won its 26th straight game, defeating a good Nutley team, 4-0, in Westwood, on May 27. IHA (27-1) and Nutley (23-6) will enjoy a few days off, before resuming practice on May 30. Both teams are in action Tuesday, with Nutley, the defending state sectional champ, hosting Middletown South in a sectional semifinal while IHA, the top seed in North Jersey, Non-Public A, opens its bid for a second straight state title, by welcoming Union Catholic. 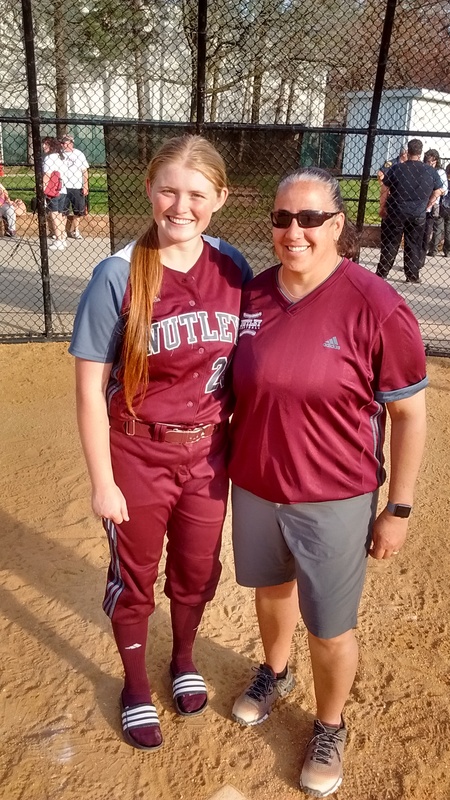 This particular game was set up just two days ago, as both coaches, Nutley’s Luann Zullo and Diana Fasano of IHA, wanted to try and get their players one more game, before the holiday weekend, to stay sharp for the state tournament. (Left to right) IHA’s Olivia Sprofera, Taylor Kenerson, Sonia Sharma and Emilie Cieslak, here with Joe LaRezza, have been playing well for the Eagles, all season long. Fasano, whose team had blanked Morris Knolls, 4-0, a day earlier, was much happier with her team’s performance against Nutley. Olivia Sprofera had another tremendous outing for the Eagles, striking out 11 and tossing a one-hitter. Southpaw Seattle Slew had a similar effort against Morris Knolls, pitching a two-hit shutout, with 11 strikeouts. The shutout was the fourth straight and 10th in the last 11 games for IHA. The only run scored during that streak was by Newark Academy, which took a 1-0 lead on IHA, on May 19, at Ivy Hill Park, before the Eagles responded with four runs and prevailed, 4-1. IHA pitching has accounted for 16 shutouts. Only two teams, DePaul and Holy Angels, have scored more than one run in a game against the Eagles this season. 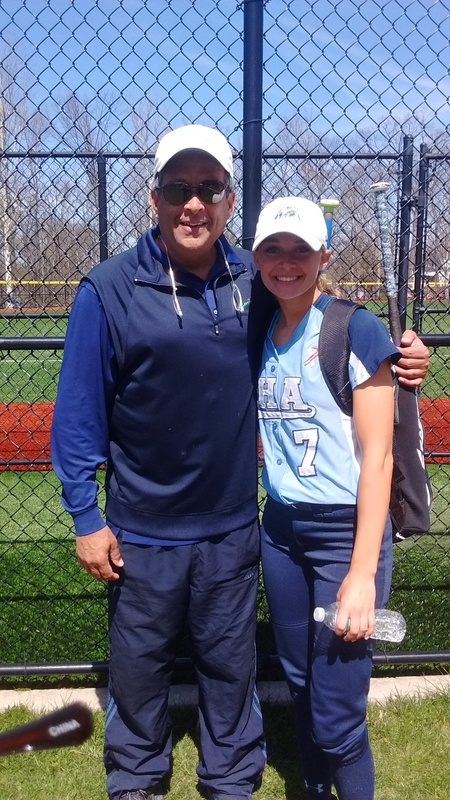 Reese Guevarra (Sunday Silence) had two hits, including a double, scored a run and drove in a run for IHA, against Nutley. The Eagles scored once in the second and added three more in the third. Sonia Sharma caused havoc on the basepaths, with her speed and ability to work out of run downs. Nutley pitcher Emily Holden (Genuine Risk) pitched well, but Nutley’s usual reliable defense, made a few mistakes during the third inning. Holden showed her grit, including three strikeouts in the fifth inning, to work out of further trouble. Alanis Concepcion had the lone hit for Nutley, in the sixth inning. The loss snapped a six-game winning streak for the Raiders. Cedar Grove wins it on 4-run sixth, highlighted by McCabe’s clutch 2-out hit, in 6-2 victory over Midland Park; Toomey tosses complete game as Faieta throws simulated contest; And yes, those ‘Faieta Cookies’ rule ! Cedar Grove’s rugged schedule in the Super Essex Conference’s American Division has definitely prepared it for another run at the Group 1 championship. Head coach Nicole Velardi saw her team play stingy defense, and with the opportunistic pitching of ‘veteran’ Kelly Toomey and a HUGE 2-out, 2-run double by Kali McCabe, the Panthers snapped a 2-2 tie in the bottom of the sixth and went to defeat Midland Park, 6-2, in a North Jersey, Section 1, Group 1 quarterfinal game, in Cedar Grove. Cedar Grove (18-12) the defending Group 1 champion, will travel to top-seeded Saddle Brook in the sectional semifinal on May 31. Fifth seeded Midland Park had gained an early 1-0 lead in the first, but Cedar Grove, the fourth seed, tied it in the bottom of the inning, then took a 2-1 lead in the second. The game remained 2-1 until the top of the sixth, when Midland Park tied it, but Toomey did a masterful job of working out of a bases-loaded, no-out jam, by allowing just the one run. 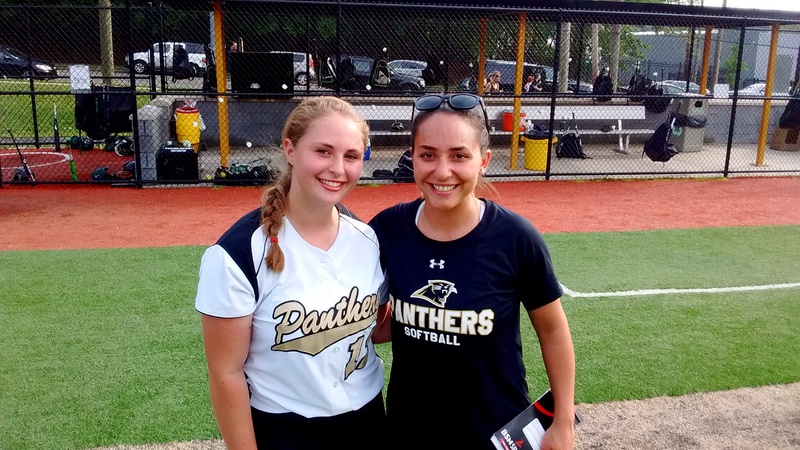 The game appeared headed to the seventh tied at two, after Midland Park retired the first two batters, but Cedar Grove caught fire, which was highlighted by McCabe’s game-winning hit, that gave the Panthers a 4-2 lead. Olivia Spinella followed with a run-scoring single that made it 5-2. Head coach Nicole Velardi and Kali McCabe, who had the game-winning hit for Cedar Grove in its quarterfinal game with Midland Park. (Click on photo for larger image). While Toomey is just a sophomore, pitching in big games is already second nature for her. As a freshman, she was the winning pitcher in the state championship game. Ava Mandala drove in two runs for Cedar Grove and Ava Fernandez drove in a run, as well. Velardi had freshman pitcher Mia Faieta warming up during the game, beginning in the second inning. Later, Faieta was kidded that she pitched a complete game, just getting ready. Faieta’s mom, Fran, is also the chief chef of some great chocolate chip cookies. And after a taste tonight, it was easy to see why everyone on the Panthers enjoys them. 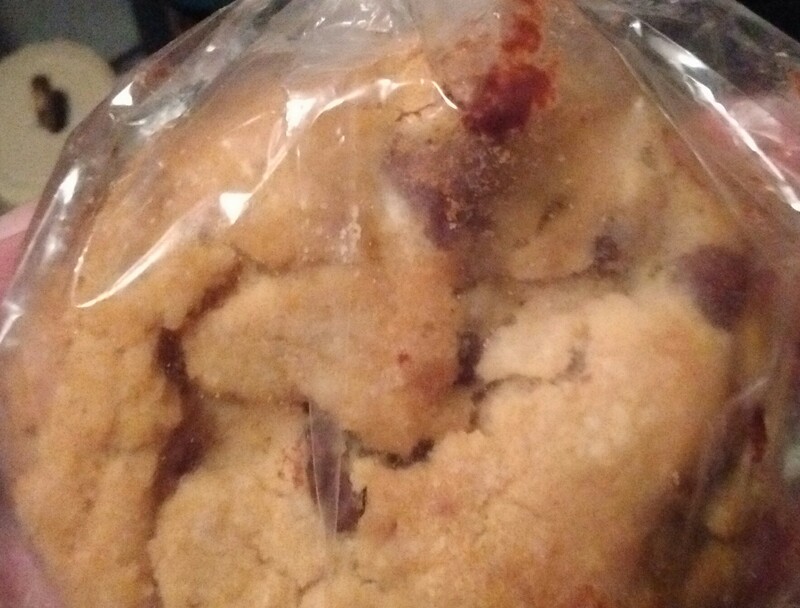 These cookies would be great on PDGIsland. “Aren’t they good?” said Velardi, in discussing Fran’s cookies. Livingston senior Blake Saperstein gathered her teammates around the visiting dugout at Kearny, and issued a simple directive, as her team was getting ready to bat in the top of the third inning. 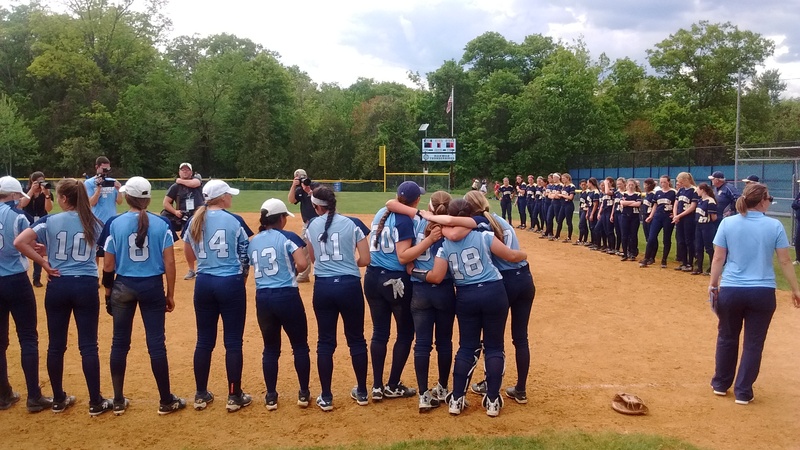 The Lancers, seeded seventh in North Jersey, Section 1, Group 4, responded in a big way, scoring five runs, with two coming in on a big double by Ally (Rolls) Royce, and defeating second seeded Kearny, 8-3. Livingston (15-11) will visit North Bergen, the third seed, in the semifinals on May 31. The winner of that game advances to the championship later next week. Livingston last won a sectional title in 2013. The Lancers were defeated in the sectional semifinals the past two seasons, losing to Roxbury in ’14 and Ridgewood, last year. Emmy Cooney and Nina Petrillo had two hits each for Livingston. Cooney, a sophomore catcher, threw out a would-be base runner attempting to steal second in a key situation, late in the game. Kate Sheehan also drove in a run. 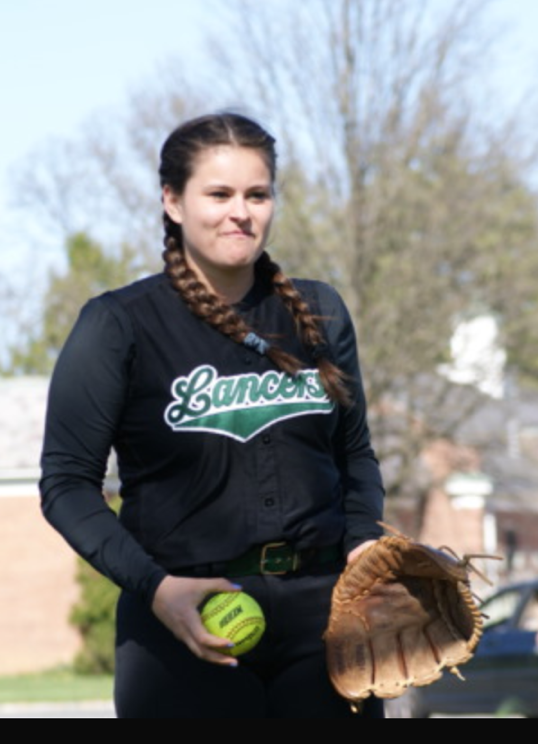 The Lancers added a solo run in the fifth, then put on two insurance tallies in the seventh to win, as pitcher Sydney McCormack (Syd The Kid) tossed a complete game. Kearny (20-4) scored all its runs in the bottom of the third, after Livingston had taken the 5-0 lead. McCormack, who walked the first two in that frame, then settled down and pitched well for the remainder of the contest. She scattered eight hits. Nutley, the defending champions in North Jersey, Section 2, Group 3, won its sectional quarterfinal, defeating Matawan, 5-1, in Nutley. The Raiders got an excellent game from senior shortstop Stefanie Ziemer, who was 3-for-4, with three runs scored, and Breanna DeMaio, who hit two doubles and drove in a run. Winning pitcher Emily Holden (Genuine Risk) spun a one-hitter, striking out seven and walking two. 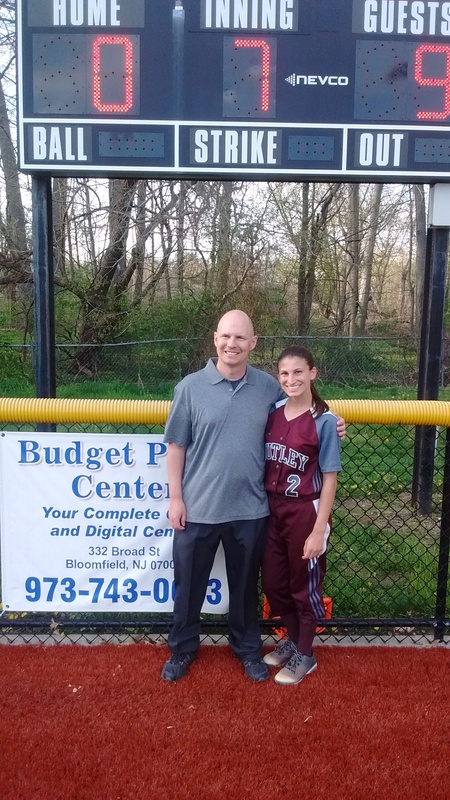 Stefanie Ziemer, here with her dad, Bill, earlier in the season, has been a big part of Nutley’s tremendous season this spring. (Click on all photos for larger image). Nutley has won six straight, and has outscored its opponents, 47-6, during that run. 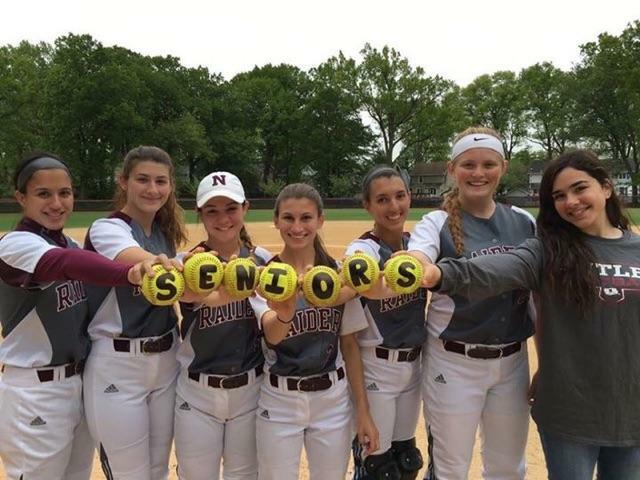 Nutley’s seniors have been a big part of the team’s outstanding season. West Essex improved to 24-2 with its second straight 10-0 win, in the North Jersey, Section 1, Group 3 tournament. The Knights last won a state sectional title in 2010, and advanced to the Group 2 state semis, where it lost to Indian Hills. Ironicially, Indian Hills will be West Essex’s opponent on May 31, in the sectional semifinals. The teams met in a regular season game on May 16, with the Knights winning, 9-4. 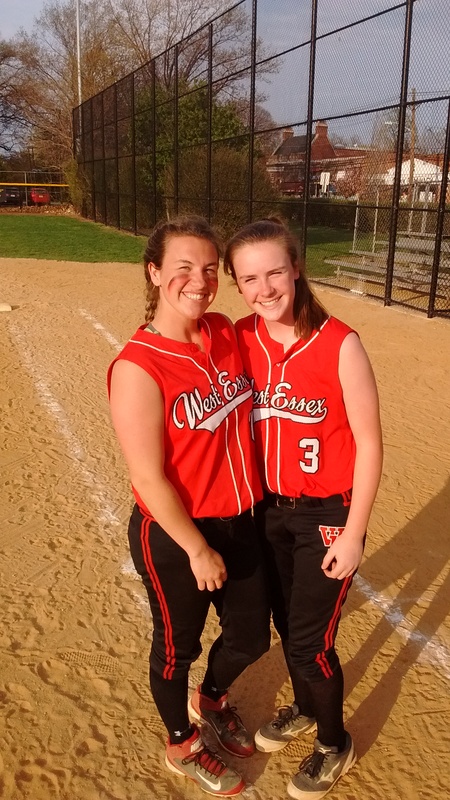 Sami Huetter (Canonero II) pitched another complete game for West Essex, throwing a no-hitter. She also continued her torrid hitting, with three hits. Bridget (Over Troubled Water) Betley had another huge day, with three hits. Bridget Betley (right) and Alexa Vardiman continue to swing the bat well for the Knights. Alexa Vardiman (Funny Cide), Julia Vardiman and Kate Jencarelli had two hits each for the red-hot Knights, which won its ninth straight game. During that run, West Essex has dominated, outscoring its opponents, 68-13. Sami Huetter’s bat has been a surprise asset to her overall game. Essex County will be well-represented in the NJSIAA, public sectional quarterfinals, on May 25, as West Essex, Livingston, Caldwell, Columbia, Millburn, Cedar Grove and Nutley were all slated to play. The winners would get a long Memorial Day weekend to think about the respective semifinals, next week. In one instance, two teams from Essex, Columbia and Millburn, will play each other in the quarters, so, obviously only one can advance. Among the Non-Public’s in Essex County are Mount St. Dominic, the second seed in Non-Public A and top-seeded Newark Academy and fifth seeded Montclair Kimberley, in Non Public B.
Montclair did not qualify for the NJSIAA Tournament, but no team was playing better down the stretch. Coach Phil Delgado’s Mounties advanced to the Essex County Tournament final, before falling to West Essex. 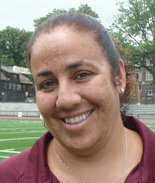 Congrats to Nutley coach Luann Zullo, who won her 400th career game, last week. Here’s more on Zullo’s accomplishments. Zullo’s wins have come at West Essex and, for the last 18 seasons, at her alma mater. Nutley players presented coach Luann Zullo’s her 400th career win, last week. (Click on photo for larger image). It’s been quite a year for coaching milestones in Essex County, as Bob Mayer of Bloomfield and Mount St. Dominic’s Lorenzo Sozio each won their 500th career game, Zullo won her 400th, the Mayor of ShangriLa, Livingston’s Jason Daily claimed number 300 and the Queen of West Essex, Andrea Mondadori, gained number 200. Here’s a look at the updated FMTC, Top 10. 1-West Essex (23-2): The newly-crowned Essex County Tournament champions are the top seed in its state section, and will take on Wayne Valley on May 25. 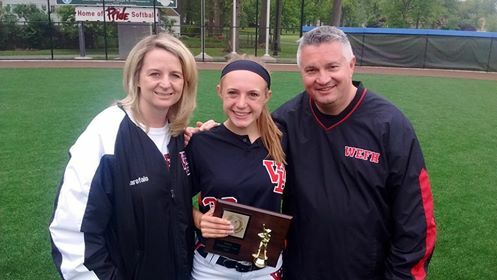 Amanda Garofalo and her parents, Michele and Bill, celebrated a county title for West Essex last Saturday. (Click on photo for larger image). 2-Mount St. Dominic (24-3): The second season for the highly-motivated Lions includes an out-of-conference game on Memorial Day weekend, against Morris Knolls, then full steam ahead to the Non-Public A tournament, and a hope to repeat their marvelous 2014 season. 3-Nutley (22-5): There’s a reason why the Raiders are the defending state sectional champions. They’re tough in clutch time. Nutley is in a really tough section, meaning it will probably have to get through both Middletown South and Middletown North, to claim a second straight title. But with Genuine Risk (Emily Holden) in the circle, and having played a tough schedule all season, why not Nutley? 4-Montclair (10-15): When the post-season honors come around in a few weeks, there’s no question who will be a favorite to gain Coach of the Year honors, within Essex County, at least on this page. The Mounties’ slow start kept them out of the state tournament, but the team was marvelous in the county tournament. 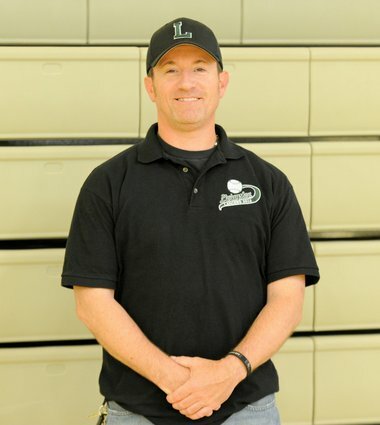 5-Livingston (14-11): The draw in North Jersey, Section 1, Group 4 fared well for the Lancers, which was slated to face Kearny in a sectional quarterfinal on May 25. Never count out the Big Green Machine, especially if Syd The Kid pitches like she did in first round game against Passaic Tech. 6-Cedar Grove (16-12): The Panthers have all the tools to be a repeat state sectional champion. The team’s base is very young, but playing a rugged SEC American Division schedule this year could put them in good stead for the state tourney. 7-Bloomfield (12-14): A loss to Kearny ended the Bengals’ season, and concluded the high school careers of two outstanding players in Courtney Politz and Sam Corio (Pleasant Colony). A young nucleus returns in 2017 for Bob Mayer’s squad, however. 8-Newark Academy (16-7): If ever there was a season for this team to play in a state final, it’s 2016. An excellent group of players and a veteran coach could get the Minutemen a trip to Kean University on the second weekend in June. They are the top seed in the North, Non-Public B. 9-Caldwell (14-9) : The Chiefs are the third seed in its section and will take on a good Lodi squad on May 25. Never discount a Mike Teshkoyan-coached team in the state tournament. 10-Millburn (21-3): An SEC Colonial vs. SEC Liberty matchup is in store on May 25, as Millburn takes on Columbia in the state tournament. The story has been well documented. The passing of Anthony LaRezza on Feb. 4, 2016, left the Immaculate Heart Academy community devastated. But through the grief, the Eagles knew a season was rapidly approaching. 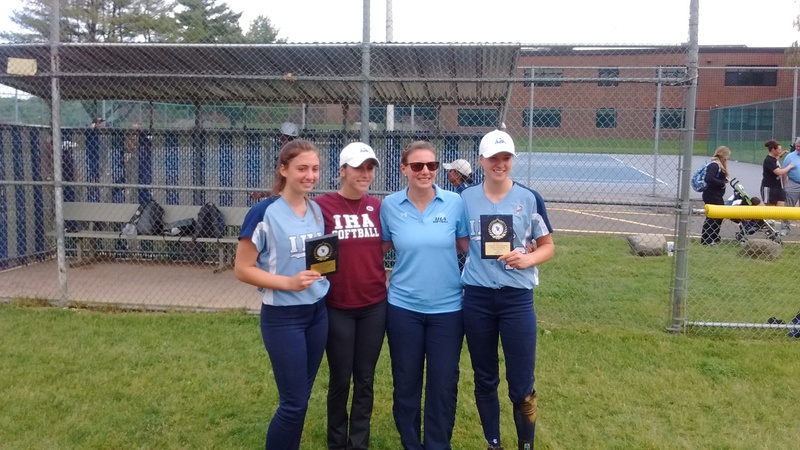 The quick appointment of assistant coach Diana Fasano was well received throughout the state, as well, of course, from the IHA players and parents. Joe LaRezza, far right, joined the Eagles after the Bergen County championship game. Joe has been a regular at IHA games this spring. (Click on all photos for larger images). But there was still that question as to how the team would perform, once practice started, a month to the day of Anthony’s passing. And then, there was that first scrimmage on March 11, when Demarest came to IHA. Now, bear in mind, this was a scrimmage, on a chilly late winter afternoon. But walking into the facility, you could hear the kids cheering, during infield warm up time. 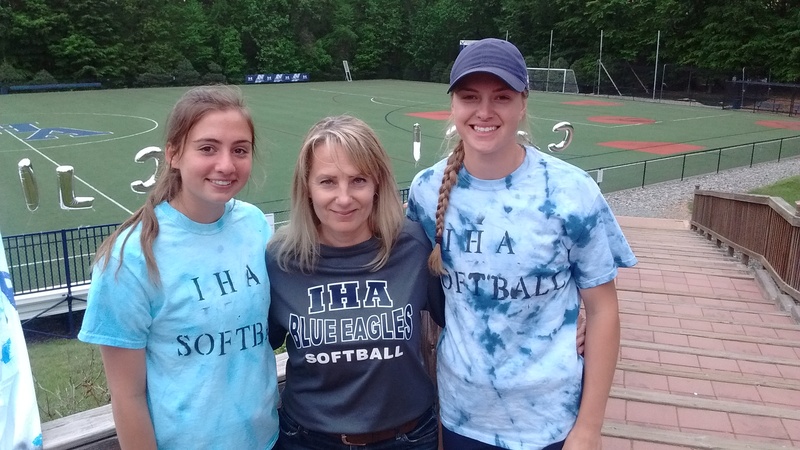 Lisa Kenerson (center), with her daughter, Taylor (right) and Olivia Sprofera, has been a regular at IHA games, along with so many other great parents. And when that scrimmage started, there were parents, EVERYWHERE, just watching the game. Bob Jones would be in his usual perch, away from most, watching his daughter, Reagan, play third base. And there were the Kenersons, the Siclaris, the Sproferas, the Sharmas, the Carrs, the Guevarras, the Cieslaks…and it can go on, and on. Parents watching a meaningless scrimmage, because that scrimmage, and the ones that followed, was far from meaningless. It was about taking care of a loved one, supporting a daughter, a niece, a God child, a friend. Father-Daughter moments are always special. Above, Kevin Kenerson and Taylor Kenerson. Below, Bob Jones and Reagan Jones. Bottom line was, they were there. And they’ve been there, for every game. Sevan Sprofera’s famous pacing, with every pitch, should elicit a tee-shirt one day. (I Liv and Let Liv, with every pitch). There was opening day, at Paramus Catholic, with all that emotion, then the home opener, when the LaRezza brothers threw out the first pitch. 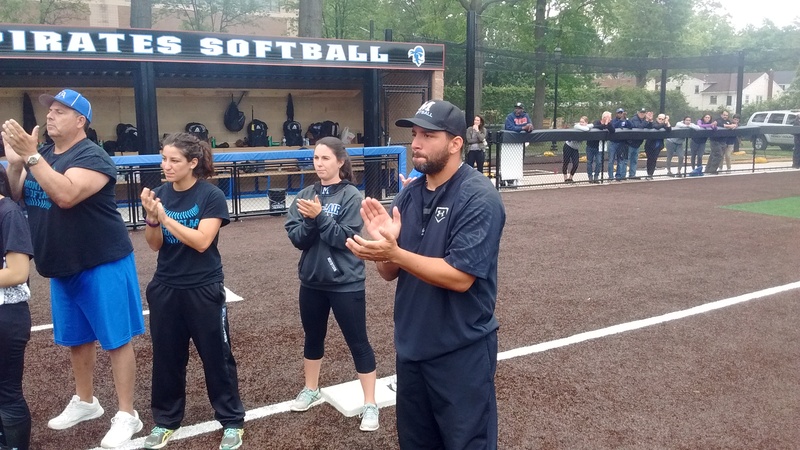 And then the IHA Tournament, now named after Anthony, and a nice speech by Newark Academy coach Serg Rodriguez, imploring the Eagles that it was now time to just play softball. The Sprofera family, Olivia (center), Sevan and John. And the team has been phenomenal ever since. They’re 25-1, entering this week’s action, with a 24-game winning streak. They’re the top seed, and defending champions, in the upcoming state tournament. 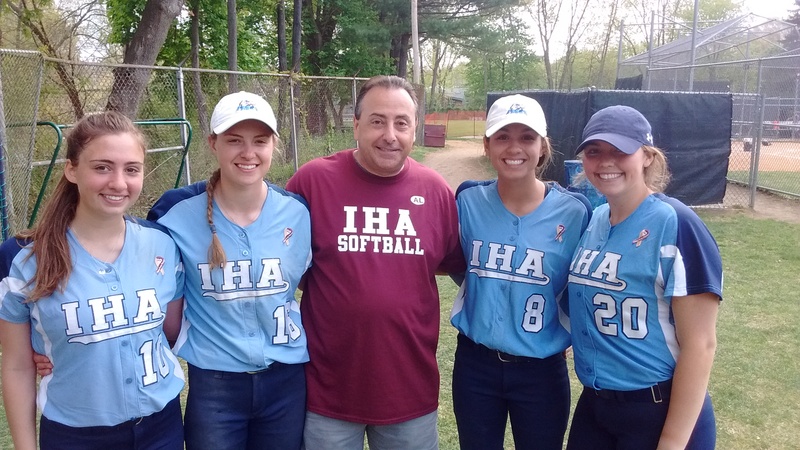 Joe LaRezza, here with some IHA friends, after a big win in Saddle Brook. And, once again, IHA is the Bergen County champion. It’s been a tough winter and an emotional early spring, but Serg set the tone on April 10, when he said it was time to just play softball again. And Fasano’s near-perfect approach, of when it get on her team, and when to lay back, a little, has been monumental. It’s been a team effort, through and through, for IHA in 2016, as it always has been, but maybe never understood as much as this year. 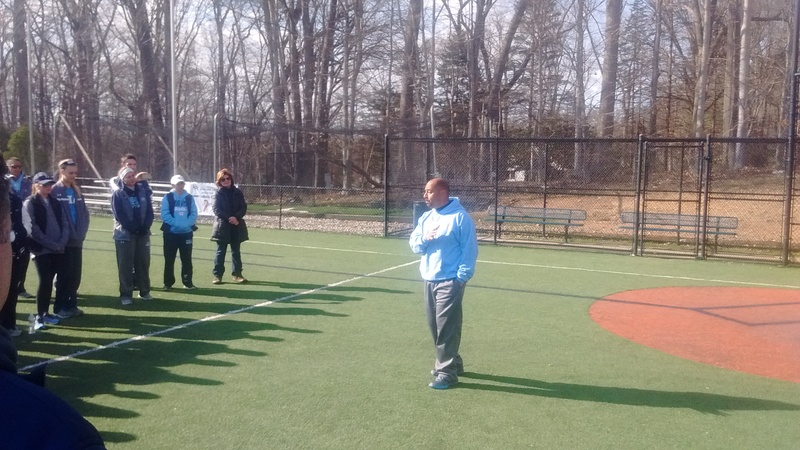 Newark Academy coach Sergio Rodriguez’s talk to the IHA players on April 10 helped set the tone for the season. 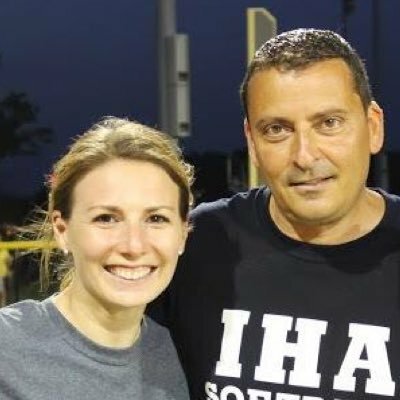 When the season ends, the IHA players will have a chance to catch their breath and remember The Big Guy, Anthony LaRezza. The coaching at IHA is in good hands. And as they get older, they’ll look back at the special assists of the IHA community, parents, administrators, coaches and fans. Talk about a team effort? Reese Guevarra’s approach to hitting is well known. There’s that traditional leap at the plate, before she steps into the batter’s box. 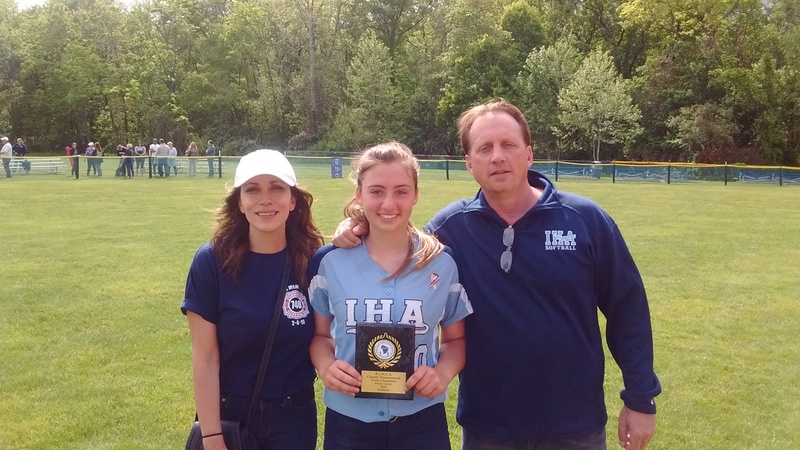 The ‘my hair is on fire’ approach to playing the game clearly motivates her teammates, especially as the Immaculate Heart Academy’s leadoff hitter. Batting lefthanded, she’s almost impossible to throw out at first base, and will sometimes slide into first, making it even tougher to catch her. 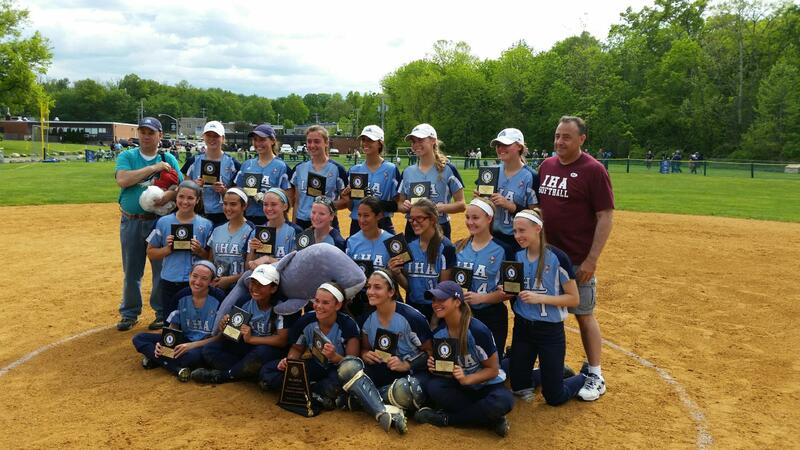 A great moment of IHA players and coaches, following the Bergen County Tournament championship. (Click on photo for larger image). 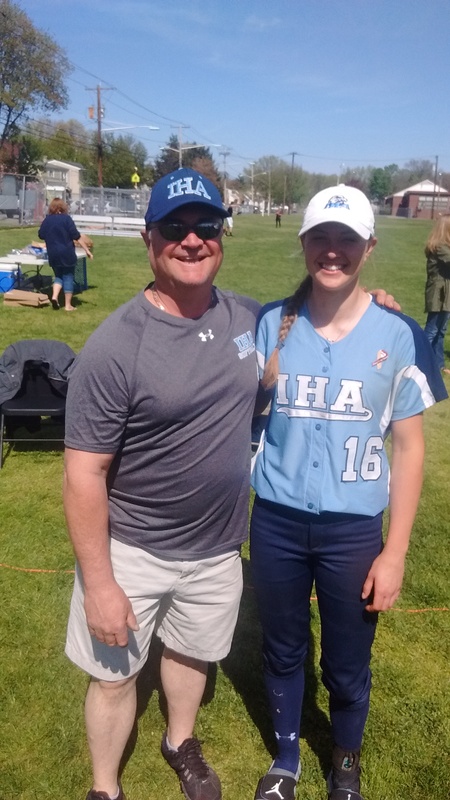 So, when Guevarra laced a two-run single in a decisive fourth inning, which gave IHA a 4-0 lead, it wasn’t surprising that Sunday Silence was in the middle of the rally. IHA, behind Taylor Gallagher’s three hits, as well as two hits each from Taylor Kenerson (Point Given), Sonia Sharma and Sarah Siclari, along with another brilliant effort from junior lefty Olivia Sprofera (Southpaw Seattle Slew) went on to its 24th straight win, and first Bergen County Tournament title in three years, by defeating a good Indian Hills squad, 7-0, on May 22, at Mahwah High School. IHA (25-1) will have a few days off before playing at Morris Knolls, in an independent game on May 26. The Eagles conclude its regular season a day later, at Cedar Grove, then prepare for the first round of the Non-Public A state championship, after Memorial Day weekend. IHA won the Non-Public A crown last season. Sprofera’s effort continued to accentuate the incredible pitching by the Eagles this year. It was the second straight shutout and eighth in the last nine games. In 24 of its games, the Eagles have allowed one run, or less. 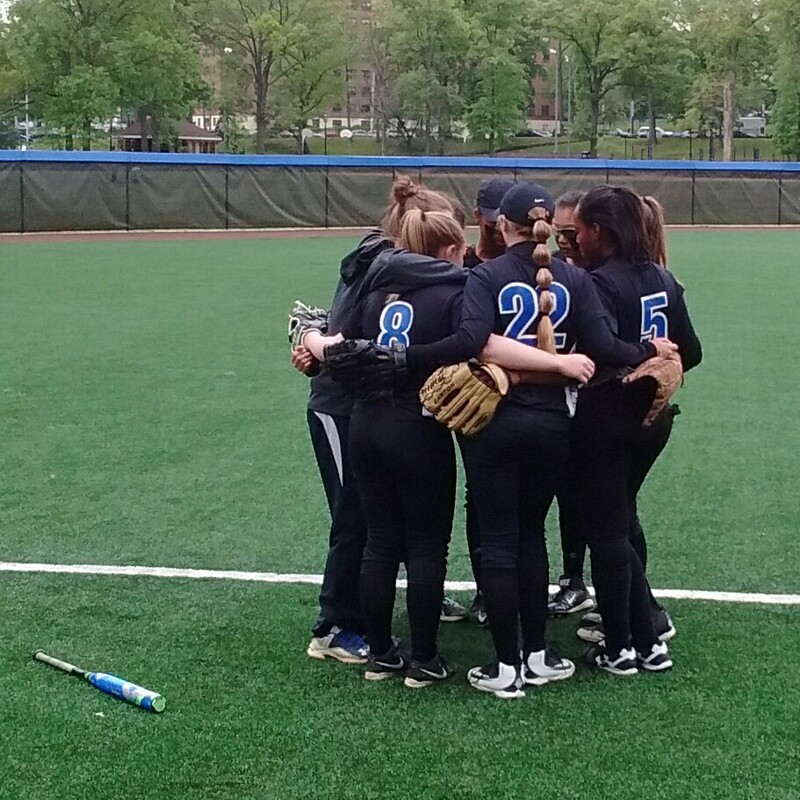 The last time a team scored more than a run against IHA was on April 11, the fifth game of the year, when Holy Angels scored twice, in a 12-2 loss. 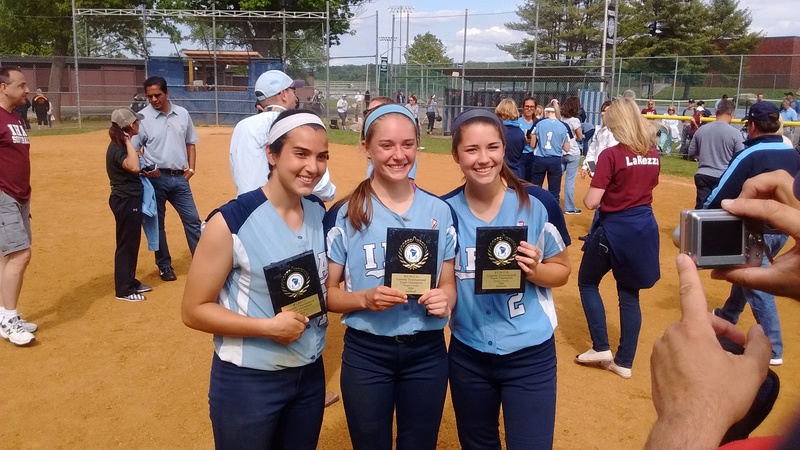 During the run to the Bergen County championship, IHA pitching allowed one run in 33 innings. IHA players enjoying the moment. IHA coach Diana Fasano noted how loose her team was today. Sprofera, who is extremely low-keyed in the circle, struck out the side in the first two innings, then seemed to let her defense do a lot more work as the game progressed. Sprofera allowed just one hit, a bunt single to lead off the seventh inning, while striking out nine, and walking two. Senior first baseman Emilie Cieslak (Tim Tam) took in the post-game celebration with a smile. The Duke-bound Cieslak was on a county champion at IHA in her freshman year, 2013, then played on a pair of BCT runner up teams, the past two seasons. Sarah Browning, Victoria Casey and (The) Reagan (Revolution) Jones also had hits, with Jones’ single driving in the game’s first run in the second inning. Jones seems to have a specialty about accounting for the first, or last run, in a key game. In the 2015 state final, she scored the game’s only run, in the bottom of the seventh, to clinch a state championship. In the season opener this spring, Reagan scored her team’s first run of the season. And today, she drove home the first run of the game. The post-game celebration included a moving moment. As the teams lined up for the trophies, a new plaque was displayed. A special plaque for a legendary coach. (Click on photo for larger image). 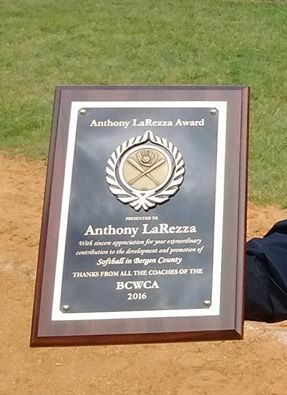 The first Anthony LaRezza Award, For Extraordinary Contributions to the Development and Promotion of Softball in Bergen County, was, appropriately presented by the BCWCA, to the IHA coaching staff. 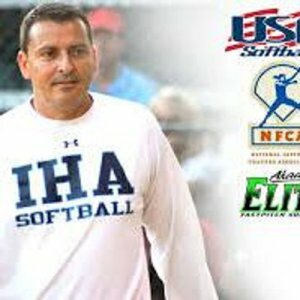 The Anthony LaRezza Award, of course, is in memory of IHA’s legendary coach, who died on Feb. 4, 2016. The award will be presented, annually, to someone deemed deserving of carrying on LaRezza’s legacy, within the county tournament. While the award was being handed out, the emotions carried over, somewhat, in the eyes of the IHA players, and some parents, as well. “I got pretty choked up, when that award was presented,” said Bob Jones, Reagan’s dad, who is a regular at every IHA game. Anthony’s brother, Joe LaRezza, has also been in attendance for most of the team’s games this year, and enjoyed watching the Eagles celebrate a title. Phil Delgado loves the game of softball enough not to take himself too seriously. He was like a kid in a candy story, watching his Mounties win three games to advance to the Essex County Tournament championship game, for just the second time in the program’s history. And while the fourth game didn’t come out the way Delgado would have liked, the coach couldn’t help but be proud of his team’s accomplishments. 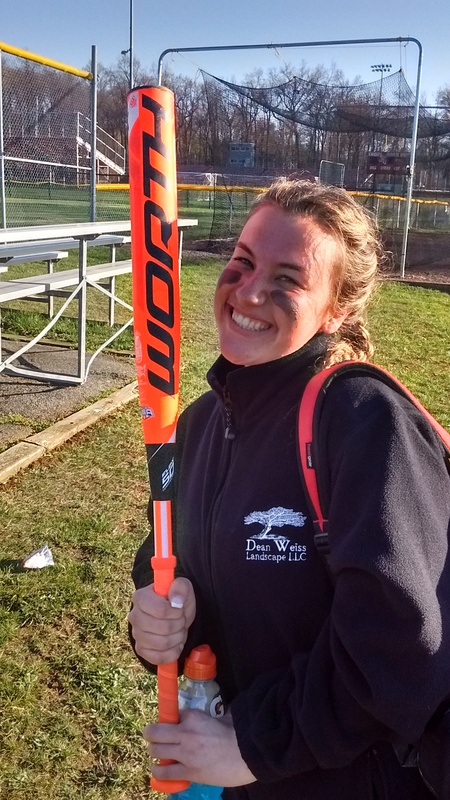 West Essex won the 39th ECT, defeating Montclair, 11-3, at Ivy Hill Park, on May 21. What was once a 3-13 team, the Mounties would win seven straight games, including the aforementioned run to the county championship game. Along the way, Delgado liked to joke he was on an island, with his team, and that if the Mounties would reach their potential, it would happen with hard work and a commitment to a team effort. 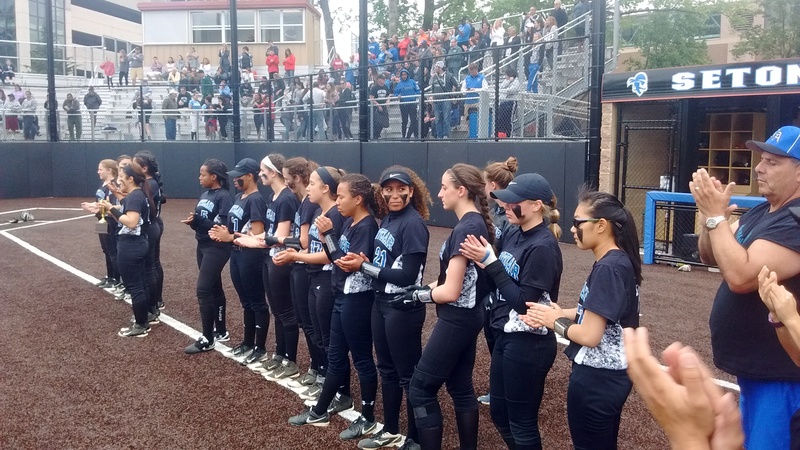 Montclair had won a spirited semifinal a little after 9 p.m. on May 20, against Livingston, before one of the biggest crowds in recent memory at Ivy Hill Park. With the forecast for May 21 predicted to be rain in the afternoon, it was decided to move the starting time of the championship game from 7 p.m. up to 11 a.m. And while the Mounties seemed a little sluggish out of the gate in the championship game, Delgado wasn’t about to hear excuses. Montclair players after the game, as the championship trophy was presented. Delgado was also ecstatic with his team’s turnaround in 2016. While the Mounties did not qualify for the NJSIAA Tournament, it made the ECT its ‘Big Dance.’ Montclair would defeat Caldwell in the first round, 6-0, then stunned two-time defending champion Mount St. Dominic, 4-3, in the quarterfinal round. The Mounties then defeated Livingston, 7-4, in the semifinals, for Montclair’s first win against the Big Green Machine since the 2010 state tournament, before meeting West Essex in the finals. The Mounties and Knights split two regular season games this spring. The score was not indicative of Montclair’s effort in the final. The Mounties fell behind, 3-0, in the first inning, but would rally back to cut the deficit to 3-2, in the third inning. After West Essex opened a 6-2 lead, Montclair came back again, loading the bases in the top of the fourth inning, with two outs. The next batter lofted what appeared to be a two-run single, but West Essex’s Bridget Betley made the defensive play of the game, making an over-the-head catch for the third out. A classy Phil Delgado, and his coaches, applaud during the presentation of the championship trophy to West Essex. Montclair’s defense, which was incredible in the semifinals, wasn’t as strong this time around. The Mounties made five errors. Erica Robles, who has been fantastic down the stretch of the season, hit a solo homer in the fifth inning for Montclair’s final run of the game. Sofie Fachin, Amber Matthews, Ciarah (Willie Mays) Minning and Lilly Silverstein all had hits for the Mounties and Paige Davenport drove in a run. Junior pitcher Jessie (Nyquist) Masur pitched her heart out. Masur’s effort over the last six weeks has been phenomenal. Delgado was able to keep his sense of humor, afterward. Satellite images indicate that PDGIsland will be just fine, after a West Essex-storm hit. Montclair’s season still has a few games left, including its Senior Day festivities on May 23, at home, against Hudson Catholic. “Next year, we’re making a run at the big show,” said Delgado. Hard to doubt the man, after what this year’s team accomplished, and a strong nucleus returning, in 2017. Bridget (Over Troubled Water) Betley made it a point of saying, “I’m tired of reading about our loss to Montclair,” she had said, with that mischievous grin, which she generally uses in mock horror. 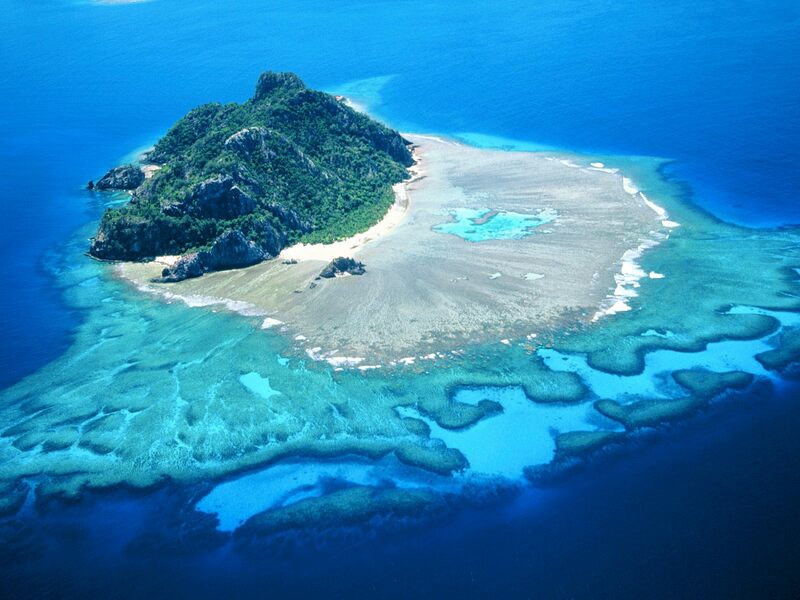 “No more, got it?”, Betley chuckled. Betley (AKA B-Squared) was referring to her team’s 3-2 loss to the Mounties on May 10, in eight innings. While the junior second baseman is having a tremendous season, Betley is quick to point out mistakes in her game more than taking credit for successes. When she struck out in a key situation in that game, Betley made that a motivation to succeed if the teams met again. Bridget Betley takes a moment to smell the roses, following West Essex’s win in the ECT final. (Photo courtesy of the Betley family). 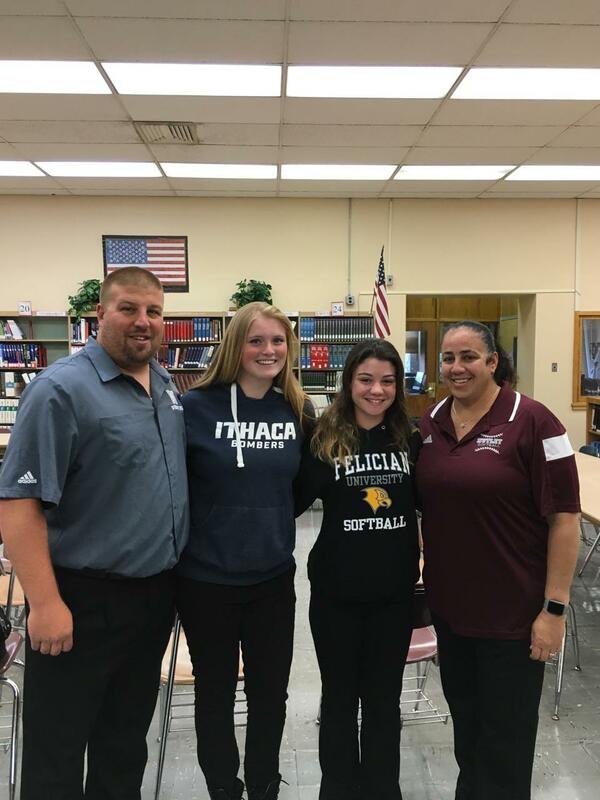 Well, the third meeting between the Knights and Mounties came on May 21, in the Essex County Tournament championship game, and Betley was a force at the plate, with three hits and five RBI. But it was a defensive play she made in a critical situation in the top of the fourth inning, that kept the momentum in West Essex’s favor. 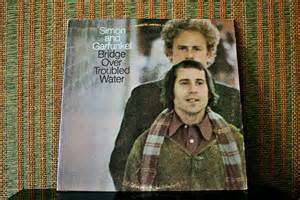 Copies of the album could start selling again, in droves. Montclair was trailing, 6-2, but had loaded the bases, with two outs. The next hitter hit a fly that appeared headed to no-man’s land between second and centerfield. With the base runners going on contact, two runs would have easily scored. But Betley never stopped striding toward the ball, and made a beautiful over-the-head catch to end the rally. West Essex (22-2) would put the game out of teach in the bottom of the fourth, scoring four more times. The championship was West Essex’s fourth overall in the 39-year history of the ECT and first since 2007. 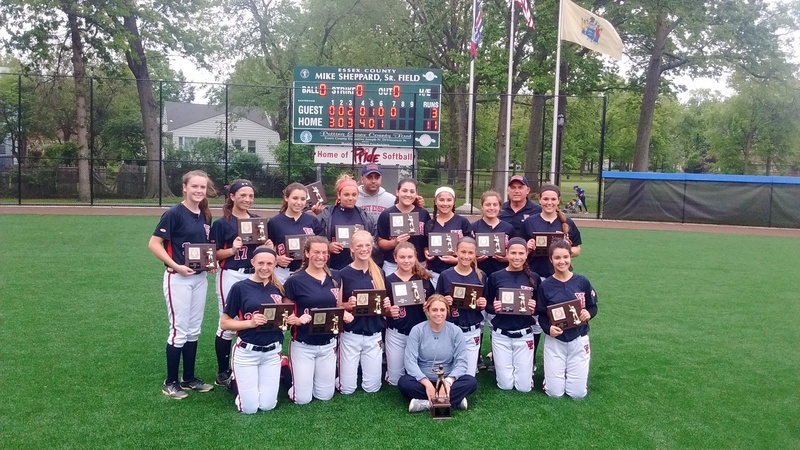 West Essex has won its last two titles with Andrea Mondadori as head coach, after taking the first two under the direction of now-Nutley head coach, Luann Zullo. The Knights had lost its last two county final appearances, in 2010 and 2015. A touching scene occurred at the outset of the game. During the introductions, when players generally shake the hand of the opposing coach, the West Essex players made it a point of hugging Delgado. 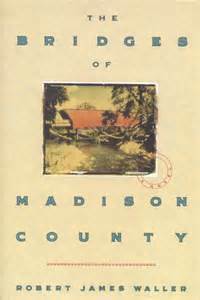 The stars of the Bridges of Madison County, Bridget (right) and Madison. Betley, the ‘Bridge” of the ‘Madison’ County combo, was on base in the third when Madison Gemma, a fellow junior at West Essex, launched a long homer over the right field fence, to give the Knights a 6-2 lead. Montclair (10-14) had cut the lead to 3-2 in the top of the third inning, but then committed some key errors in the bottom of the frame and West Essex jumped on those mistakes for three runs. The Gemma family is putting together a nice history in the ECT. Madison’s older sister, Olivia, played in four straight ECT finals, from 2011-2014, for Mount St. Dominic. Olivia, who now plays collegiately at Stevens Institute of Technology, also has an ECT homer to her credit, with hers a dramatic two-run blast in the bottom of the sixth inning of the 2013 semifinals to defeat Cedar Grove, 4-3. Olivia played on a county champion in 2014 at Mount St. Dominic, and Madison now has one, two years later. Mike Gemma, Madison and Olivia’s dad, was proud of his daughter’s accomplishments. Winning pitcher Sami Huetter (Canonero II) was destined to play well. After all, it was Preakness Day. Nearly a year ago, Huetter was injured in the first inning of the 2015 ECT final, and West Essex was defeated by Mount St. Dominic. Huetter continued her hot hitting, as well, with three more hits, and an RBI. West Essex’s only senior starter, Kate Jencarelli, had another tremendous game, with two hits, including a double and three RBI. Freshman shortstop Julia Vardiman led off the bottom of the first with a long double, that hit the ‘Monster’ fence in left field. She went to third on a hit by older sister, Alexa Vardiman (Funny Cide) and both Vardimans came around to score on a Betley triple. Jencarelli then singled home Betley to make it 3-0 in the first. Mondadori was pleased with the win. West Essex will seek its first state sectional championship since 2010. 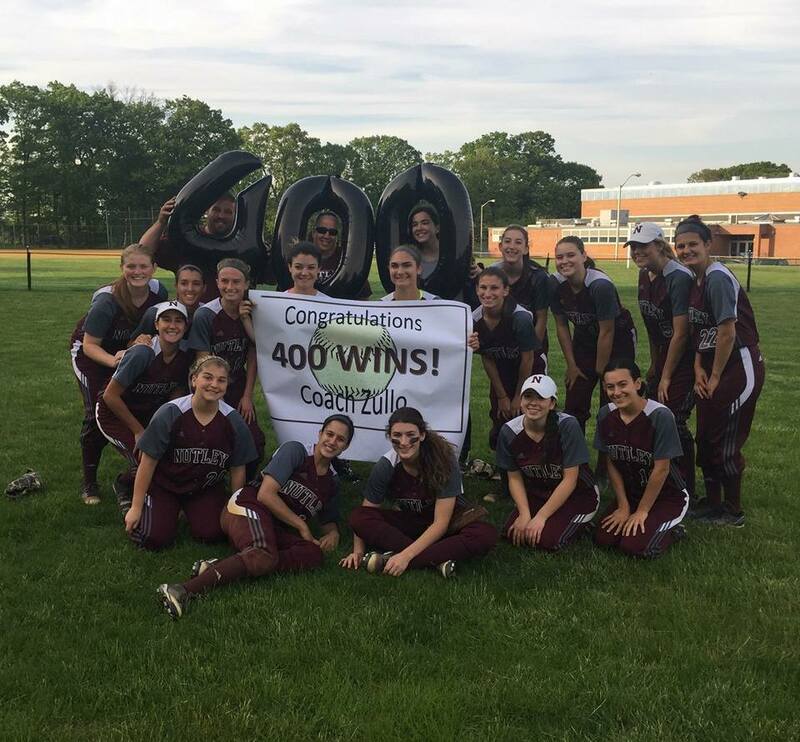 Nutley coach Luann Zullo attained a lofty milestone, with her 400th career victory, as the Raiders defeated Sayreville, 9-4, on May 20. Zullo began her coaching career at West Essex, where she led the Knights to back-to-back Essex County Tournament titles, in 1997 and 1998, before returning to her alma mater in 1999. She’s led Nutley to multiple state sectional championships and in 2010, guided the Raiders to the Group 3 final. In 2011, Nutley won the Essex County Tournament crown, making her the only coach in ECT history to lead two different schools to championships. Nutley players celebrated Coach Zullo’s 400th victory. (Click on photos for larger image. Photo courtesy of Mike DiPiano). A member of the NJSIAA Hall of Fame, Zullo was lauded by assistant coach Mike DiPiano. 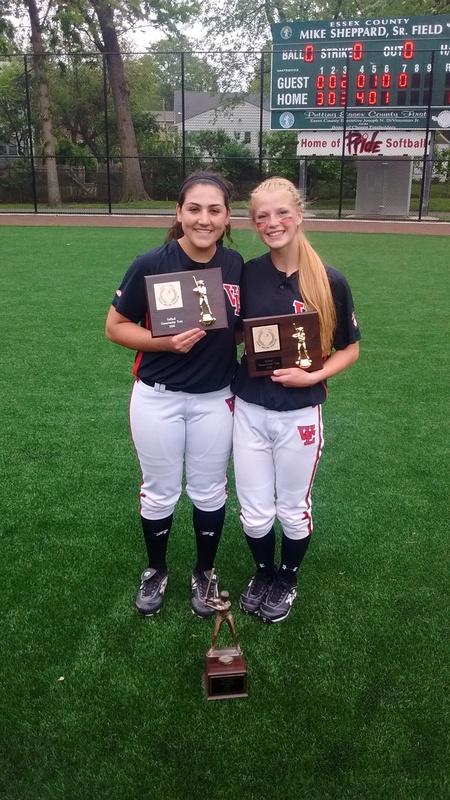 Zullo with star pitcher Emily Holden earlier this season. Its been a good year for coaching milestones in Essex County. Bob Mayer of Bloomfield and Mount St. Dominic’s Lorenzo Sozio each won their 500th career game this year. Livingston’s Jason Daily won his 300th a week ago and Andrea Mondadori of West Essex took home her 200th last month. DiPiano noted that the celebration will be quick, as Zullo will focus on the NJSIAA Tournament, which starts next week. Nutley is 21-5 and the second seed in the state sectional. “We are going to celebrate this for a little tonight with the team, family, and friends,” said DiPiano. “But tomorrow, Luann will be back at work, and all of our focus will be on getting that one win that’s eluded us. She’s already going over what we need to do to get better on the bus right now. Zullo and Mike DiPiano, with star players Emily Holden (second from left) and Breanna DeMaio.